BMW 330 - Is it the ‘perfect’ motor car? Following on from our short test of the BMW 330 last year, the opportunity presented itself to have the car for another week. This gave me the chance of seeing what this vehicle could really do, with a trip to Kanchanaburi, as well as local running. And in answer to my own question as to whether the BMW 330 is the perfect motor car, the simple answer is, No, it is not the perfect motor car - but it goes damn close! At the outset, let me set some ground rules. This is certainly not the cheapest motor car on the block, or even in the BMW showrooms, with eight others cheaper than the 3.55 million price tag on the 330. This is even more expensive than the 5 series vehicles for sale here, though much less than the 7 series. You can also get the smaller engined Z3 for under that price, so the 330 has certainly got some prime cars to prove itself against. It has the largest engine in the smallest body and with its 219 bhp (detuned to get under the Thai 220 bhp tax bracket) it still has more ponies than all the other BMW cars, bar the 7 series (or the M3, not readily available here). So with the most powerful engine in the smallest body, on paper it is very much a performance vehicle. On the road, the theory is well proven, effortless power and spirited acceleration make this a very safe car. If you have the requisite driving skills, the BMW can power you out of many potentially threatening circumstances. Others who put much stock on the 0-100 kays times report the BMW 330 achieving the metric ton (or is that tonne?) in 6.5 seconds. Me? I put much more stock on passing ability from 80-120 kays, the range you are generally driving in for everyday motoring. Traffic light Grands Prix I leave to the 18 year olds. The transmission on the 330 is a dual unit - fully automatic, or move the lever to the left and you have a sequential 5 speed clutchless Steptronic. The impression when you leave the transmission in the ‘auto’ mode was one of seamless changes, and the only time I moved over into the sequential manual mode was when I wanted to make sure the car stayed in one gear for big sweeping bends. Like so much of the BMW electronics, the ‘brain’ controlling the transmissions even pre-empts your driving style and when in the ‘press-on’ mood, will hold the engine revs higher up towards red line before changing. Steering is pin-point with enough ‘feel’ to keep you alert to what is happening on the road beneath you. Again on the big sweeping motorway curves you could place the car securely, no matter what speed, it seemed, though the handbook does remind the driver that despite all the super-trick suspension and electronic fiddles, the laws of physics do have to be obeyed. There is a finite limit to physical laws. However, in one week of some fairly quick A to B trips I could not find those limits. The impression that we all came away with was the ‘solidarity’ of this car. It felt taught and rigid and reassuring. With a motor car that is capable of prodigious speeds, you need a motor car that has brakes to match. The BMW 330 has them, with ABS naturally. Huge disc brakes filling the wheels. Again, there was only one time during the week that I had to apply the picks so hard that the ABS came into play - and when it did, steering was still under my control. So what about the appointments in the 330? Quoting from my own report of last year, “The interior of the car reeks quality, but then at three point five five million baht, it damn well should. Herds of slaughtered cows cover the seats and door trims, with acres of swish pile carpets under foot. 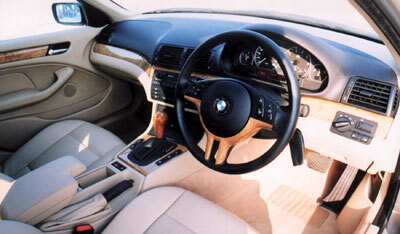 The dash is understated too, and hallelujah, a rotary knob to control the volume from the radio/cassette/CD player. The usual niceties were there as well, with an on-board computer to work out how many clicks before the next pit stop and half degree increments in the air-conditioning. There are many tricky stowage spaces with sliding shutters as well. There were two electrical power outlets for the rear seat passengers to drive lap-tops or in car faxes or phones. Turn the sun visors down and the vanity mirror has a sliding shutter too - move it aside and the light comes on so Madame can apply her make-up and step out perfectly groomed at the end! There’s not much that BMW has forgotten. Here then is a motor car that goes like stink, stops on the proverbial dime and steers like a race car. It has all the appointments that you should expect, it has an air of authority about it that makes people clear a parking spot for you, and it is probably one of the safest cars you will ever sit in. So why is it not ‘perfect’? The only ‘flawed’ area where it was not 100% for me was in the driver’s seat. Sure it moved every way, you could change the lumbar support, you could program the settings so that you could always find the correct position again after any other driver had altered it, so what was wrong? Remember that I come from many years of professional motor sport. On the road the BMW 330 could handle everything I wanted it to do, so well, in fact, that the lateral support of the seats could be exceeded. The car was capable of generating more lateral G forces than the seats could provide lateral support. A small gripe really, but for me it was the only design item that I could fault. 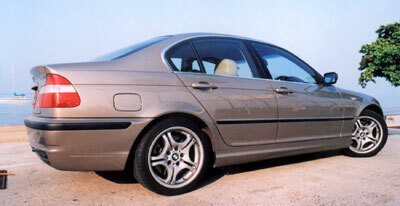 For a person who enjoys driving as an art form, the BMW 330 represents the perfect motor car - almost! I would certainly buy one and if you have the necessary 3.55 big ones then it is certainly worth looking at. I finished my test last year by writing, “How do you sum up a car that costs around the same price as a two bedroom house? For my money, it is worth it if you are a real driver, because this is a real driver’s car. For my money, I would get more enjoyment from this financial investment in a BMW than I would ever do from a house in the suburbs, but then, I never was all that practical about such things.” I see no reason to change that summation. 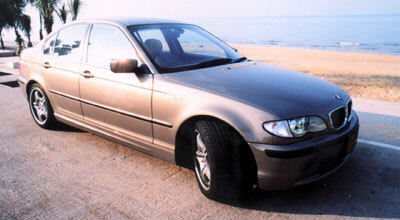 The test vehicle was supplied by BMW Thailand. Last week I mentioned the 1953 Morris Oxford which was, in my opinion, not the epitome of auto engineering in the 50’s, but it still in production today. I asked what was it called now? The answer was the Hindustan Ambassador, still the preferred politician’s chariot in India, with every one of them white I believe, and these days being powered by Nissan. So to this week. A very British make derived its name from the Japanese flag, building two experimental cars in 1899, with production starting in 1901. What is its name? Last year, while watching some of the Grands Prix on UBC and shouting abuse at the screen when the adverts came on, I discovered that China Central Television (CCTV) also televised the GP. The commentary was in Chinese, but the picture was in English! So it was possible to switch from one to the other and not lose any of the action. Now, how about this? Jordan Grand Prix has signed an agreement with CCTV and Shanghai International Circuit Co. Ltd (SIC). According to Yu Zhifei, deputy general manager, SIC, CCTV will cover every round of the FIA Formula One World Championship this year. CCTV is China’s only national broadcasting network and reaches over 100 million households across China. Its coverage of each round of the FIA Formula One World Championship will include a 20 minute preview to be aired on the Thursday before each race, live coverage of Friday and Saturday qualifying as well as Sunday’s event, and a 20-minute review on Monday. In addition, CCTV has 500 previews and over 300 special F1 news slots on CCTV’s sports channel. The Australian Grand Prix in Melbourne on March 9 attracted 26 million viewers on CCTV in the Beijing area alone, said the report. For me, the message is loud and clear. Eff Wun is coming strongly into Asia and if you play your remote correctly, you will not miss any of the sessions each race weekend. According to an interview given by Ross Brawn on pitpass.com (the best F1 site) the new regulations have made life a little easier for the teams in some directions. “Each team may now have only two choices of dry tyres for the race, but each team can make their own choice of compound and construction. We can now test and choose a tyre between races and then race that tyre the next weekend,” explains Brawn. Where things could become difficult is in the case of rain. The new regulations have not made things any easier by stipulating just one type of rain tyre for each team. “With only one rain tyre it is impossible to cater for all eventualities. You either choose a deep grooved full wet which can be dangerous and start chunking when the track begins to dry or you choose a shallow groove intermediate tyre and there will be cars falling off the road in heavy rain. We have chosen a compromise between the two that we have developed during wet weather testing during the winter, but it is not the ideal solution,” says Ross.